The Mini Lift is a screw operated scissor lift, operated by either spanner, impact drill or screwing manually. 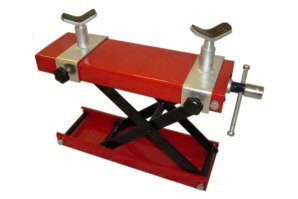 Suitable for most custom and classic machines with a flat base or low hanging frame rails, it is especially useful when used in conjunction with a workshop lifting platform. The Mini Lift comes supplied with two brackets which can be used on the frame rails to clear items such as low hanging sumps/exhausts etc. These brackets can also be adjusted individually for with and height. Minimum height: 90mm (Not including frame brackets). Maximum height: 400mm (Not including frame brackets). Frame brackets can be adjusted for width, height or removed completely. Very popular in motorcycle workshops. No, the Mini Lift comes ready to use straight out of the box. Does the Mini Lift come with a guarantee? Got a Question about the abba Mini Lift? If you would like to ask us a question about the abba Mini Lift, simply fill in the form below and we will contact you within two working days. Want to tell a friend about the abba Mini Lift? Alternatively fill in the form below and we will send an email on your behalf to your friend, with a link to this page all about the abba Mini Lift.